Russia – Visualization expert Barco was a proud visualization partner of the successful ‘The Golden Age of Russian Avant-garde’ exhibition project, which closed its doors this Monday. Created by film director Peter Greenaway (UK) and Saskia Boddeke (the Netherlands), the exhibit in the big exhibition hall of the Moscow Manege Museum was one of the centerpieces of the UK-Russia Year of Culture 2014. As a visualization partner to the event, Barco provided, through its local distributor CTC Capital, 12 ultra-bright HDX-20 projectors to fully immerse visitors into the highlights of Russian Avant-garde art. Writer and director Peter Greenaway, the curator of the event, is renowned for his exploration of the cinematic medium and for his ability to integrate Renaissance art into his work. In 2006, he began an ambitious series of video installations, where digital imagery merged with art (e.g. ‘Night Watch’ by Rembrandt). Greenaway and Boddeke decided to continue down this path for their Moscow exhibition. By using polyscreen installations made with the help of the most up-to-date projection, light and sound equipment, they want to show new aspects in the paintings and sculptures and immerse the viewer into the era of Russian avant-garde. The event organizers chose to team up with Barco as a technical partner and visualization sponsor, on account of Barco’s excellent reputation in projector technology. Barco and its AV distributor CTC Capital were confident that the ultra-bright HDX-W20 projector would best meet all the visualization needs of this lofty project. 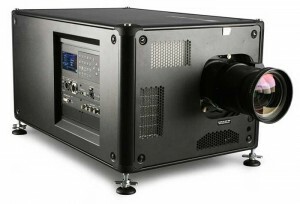 "Ensuring a light output of 20,000 lumens each, the 12 HDX-W20 projectors reproduced the works with astonishing colors and high resolution and helped create effects of amended reality to bring the art works to life on 12 different screens," said Victor Chetverev, General Director of CTC Capital. "Our team was available throughout the exhibition to lend technical support whenever needed." "Barco is proud to have supported this prestigious event and help an icon like Peter Greenaway create a dialogue between art and multimedia," said Mark Bultinck, Barco's vice-president sales. "In September last, we sponsored the Moscow Biennale. This project is yet another proof of our commitment to Russia’s audiovisual market." The Golden Age of the Russian Avant-garde’ exhibition opened on Monday 14 April and ran through 26 May. It animated more than 400 masterpieces of Russian avant-garde from the collections of the Russian Museum, Tretyakov Gallery, Schusev Architectural Museum, Bakhrushin Theatre Museum and private collections. ‘Black Square’ by Kazimir Malevich – perhaps the most famous work of Russian avant-garde – was used as the basis and the central metaphor of the exposition.